Our trip through southern Saskatchewan was great in every way. The weather was clear and hot but the grasslands were very green with flowers blooming everywhere. Usually, at this time of year, the grasslands are brown because of the heat and lack of rain but this year was pleasantly different. The birding was great also. We did not see any lifers but I did manage to add eleven photos of new birds to my collection. Several of the birds such as the Swainson's Hawk and Western Kingbird occur around here also. This week I am covering a bird that used to be quite common around Foam Lake but has been in steep decline recently. 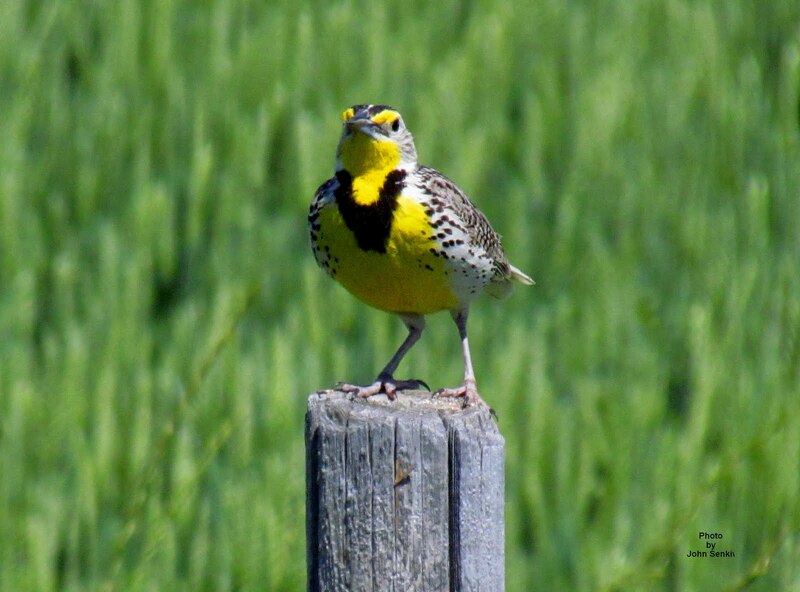 Originally the Robin-sized Western Meadowlark was a grassland's bird but as farmers cleared the land and seeded many acres into hayfields and pasture the meadowlark moved north to the new ecosystem. Now the reverse is taking place. Farmers in general are getting out of livestock and into intensive crop farming eliminating pastureland. As goes the pastureland so goes the meadowlark. However, the grasslands of the south, unsuitable for cropping, still have many meadowlarks. 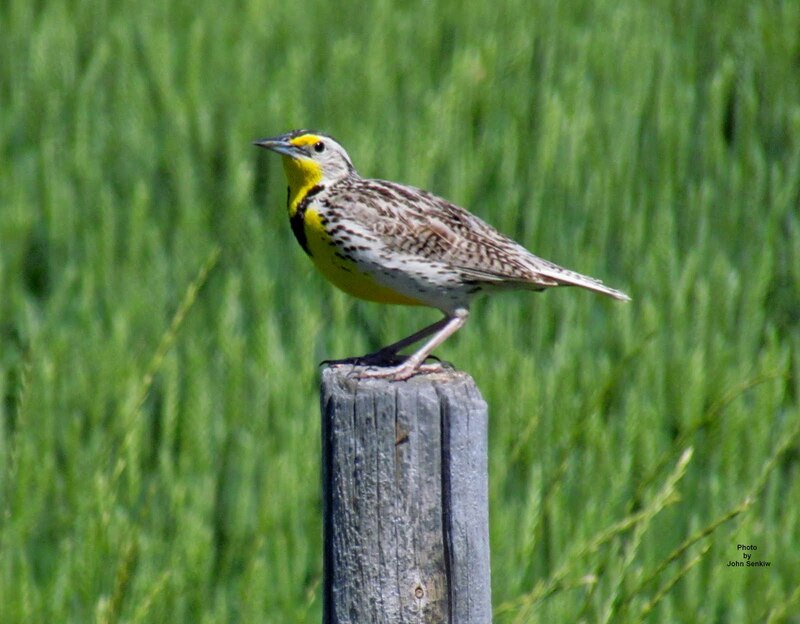 There are two meadowlarks in North America, the Eastern and Western with the possibility of a third, the Lillian's, which is still considered a subspecies of the Eastern. Except for the song the two are so similar in all aspects that, where ranges overlap, even an expert birder will hesitate to identify one in the field unless it sings. The one in today's photo is the Western because: one, I heard it sing,; two, the eastern does not occur here. The Meadowlarks belong to the family of birds known as Icterids (blackbirds) but their looks and songs do not indicate that. The only black it has is a V on its bright yellow breast, while the upperparts are brown and white striped. As the bird flies away it has a chunky, short tailed appearance. The pointed but short tail always shows a lot of white on the outer edges when the bird is in flight. Unlike most Icterids its song is really very pleasant and cheery. Males and females are the same. This week's photo was taken along a road near Val Marie, SK., Most of the meadowlarks faced away from me when I attempted to take a picture but this one was very cooperative giving me good profile and frontal views. In colour the pictures are very eye catching. Next week - the Lark Bunting. After what seems like an eternity of rain and cool weather temperatures are finally rising and things are drying up to everybody's delight. For several days in a row now we have had our morning coffee outdoors without having to wear jackets. Nice. Throw in the surrounding luxuriant vegetation and beautiful flowers all set to a background of birdsong and things simply do not get any better. Every once in awhile I do a repeat article on a certain bird and this week is one of those instances. 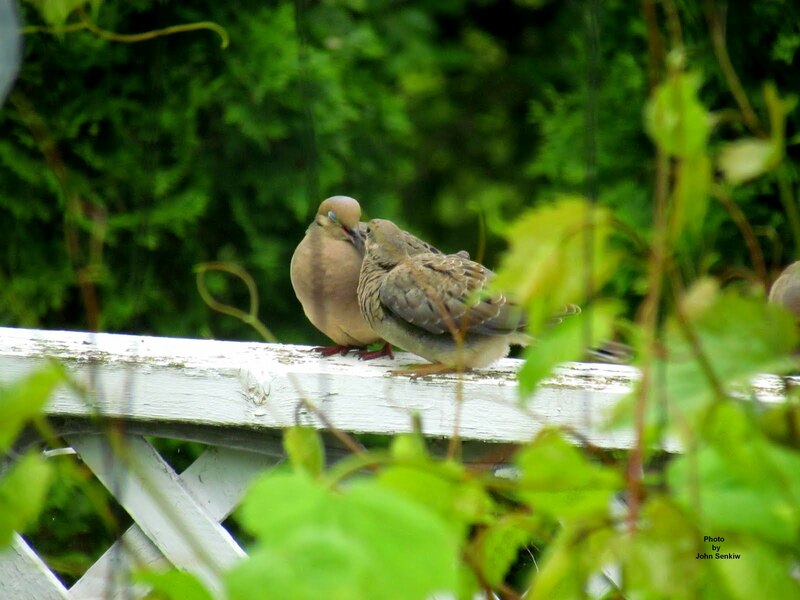 For about three or four years now Mourning Doves have frequented our back lane and must have nested there somewhere. This year the doves have been exceptionally busy underneath our black oil seed feeder eating the seeds dropped on the ground by birds at the feeder itself. They are a welcome addition to our yard. In addition to the feeding activity we have watched the doves going through their courtship ritual with the male puffing himself up to look much larger, and supposedly more desirable, to the female. The female, in turn, would touch the male's bill with her own accompanied with soft cooing. (I believe this the origin of the term "billing and cooing"). The female definitely seemed ready to "play house" as it were. The end result is that we have a Mourning Dove's nest in our backyard. This event makes a total of twelve (12) different species of birds that have nested in our yard at one time or another. As of this writing we have had six different species of birds nest in our yard this year alone. Both totals include Brown Headed Cowbirds. Pigeons in general make very flimsy nests and if possible will utilize a previous year's nest made by some other bird. 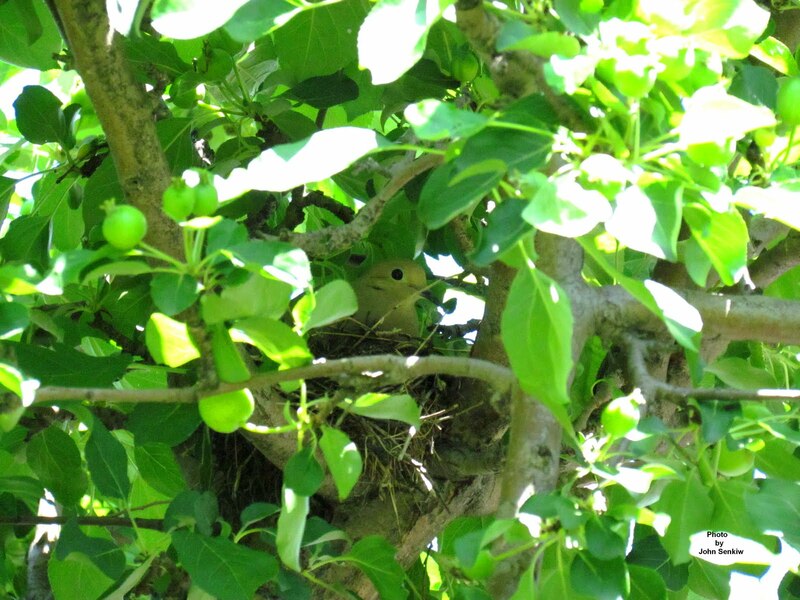 The Mourning Dove in our yard has taken over a last year's Robin's nest in our apple tree. The nest survived the winter relatively undamaged needing little refurbishing which suited the dove's lack of building skills just fine. In any case, the dove seems to like it very much. This week's pictures are of the two doves "billing and cooing" on a rail in our yard and the second is of the female on her nest watching us intently. She is very comfortable with human activity all around her and does not seem to be bothered by things such as a noisy lawn mower just a few feet beneath her. I hope nothing disturbs her to the point that she abandons the nest as I can hardly wait until the young hatch so I can watch the parents attending to them. The recent deluges along with warm temperatures have produced luxuriant vegetation, including weeds, over the whole province. Presently, the fruit trees are loaded with blossoms with the expectation of good yields of fruit later on that will come in handy for both people and wildlife. For example, the Cedar Waxwings are already utilizing the bounty by gorging themselves on flower blossoms especially apple petals. Later in the year they, along with other birds like Robins, will be eating the fruit. The rains have also had an effect on the rural landscape overall. Creeks and rivers are at capacity and in some cases overflowing; the water tables are high; sloughs and lakes are much larger in area and quite a bit deeper. All this has affected the wildlife that lives on, in or near water. Specifically, diving ducks like Canvasbacks and Scaups need larger and deeper bodies of water than dabblers like Teals and Mallards. One diver, the Redheaded Duck, needs even larger and deeper water than either the Canvasback or Scaup. 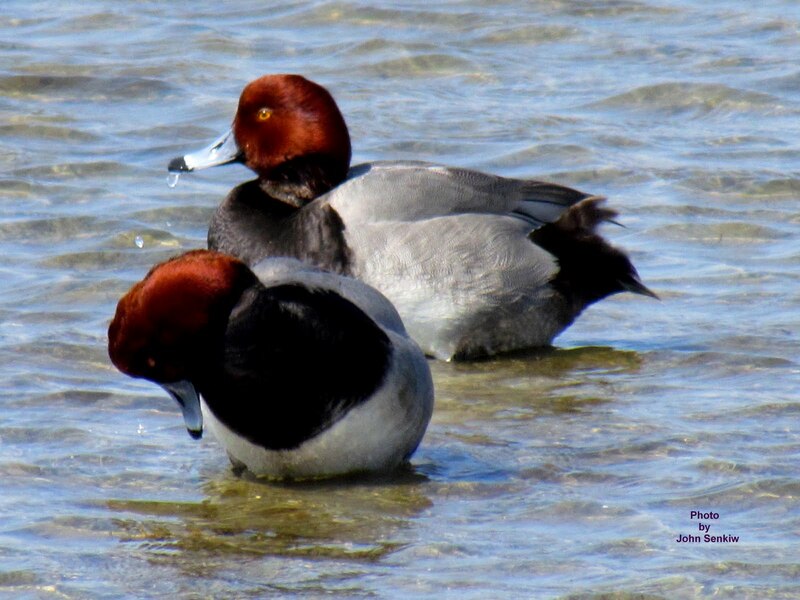 The Redhead is often confused with the Canvasback because the colour of the males' heads is the same brick red and the body colours are somewhat similar. Once one gets past focussing on the head colour the differences between the two species are quite obvious. First, the Redhead has a "duck shaped" head that curves sharply downward from the forehead to the tip of the bill; the Canvasback has a "goose shaped" head that slopes gently downward in a straight line from the forehead to the tip of the bill. Second, the Canvasback has a longer gooselike neck giving it a more slender and graceful appearance. Third, the canvasback has a nearly white body while the Redhead has a dark grey one. It is best to check out the field marks of these ducks in a bird book before going out to see them in the wild. See article No. 51 for a more thorough discussion of these two species. If a red headed duck is white with a goose-like head and neck it is a Canvasback; if it is grey with a duck-like head and neck it is a Redhead. The Redhead has another rather unusual characteristic in that it is quite parasitic and the hen will often lay her eggs in the nests of other ducks and let them do the work of raising the young. It is not unusual to see a hen Scaup with both Scaup and Redhead ducklings tagging along behind her. However, Redheads are not completely parasitic like Cowbirds and do build nests and raise the young themselves. Talk about laissez faire ducks. For the winter Redheads often migrate to southern coastal areas to feed and rest in saltwater marshes and lagoons. This week's picture was taken at a nature preserve in South Padre Island just off the coast of Texas where many of our summer residents can be seen in the winter months.